Dr.Whisky: Dr. Whisky Wins Drammie!!! Dr. Whisky was nominated BY YOU and voted for BY YOU and WAS AWARDED the 2007 Drammie award at The Scotch Blog. Sure, my passion for whisky and talking/typing about the stuff is what drives this whisky blog BUT as a non-cash-generating/ad-free blog, your emails of kind words, compliments and questions give me the motivation I need (some days more than others) to keep this thing going. Winning a people's choice award like this only gives me more fuel and I have every intention of keeping this resource alive as long as the whisky world can use it. THANK YOU! Thanks to mad-blogging linkers: Sku of Sku's Recent Eats, Malthead, Rocksoff.se, V at Scrapple from the Apple, 't Veemgericht, Emily at Waiting for Dorothy, Douglas Blyde at The Daily Wine, Jysmith at A Perspective and A Jeremiad, Dunford at Bread Party, Cigar Jack, Kristof, Darren Turpin's The Genre Files, Islay Weblog, Armin Grewe (IslayBlog), Johan (WhiskyGrotto), Home of Whisky, Stephen Rowe (Food & Plastics), Inebrio, Sweasel.com, Mattias (WhiskyBlogg), Discover Whisky, Dave and Thomas, The Avondale Evening Mail, Home of Whisky, Whiskymagazin, The World According to Patrick, Chris Taylor (Taylor & Company) Red Hare (Eclectic Elephant), Will (Nose Palate Finish), Chris Bunting (Nonjatta), Colin Ligertwood (For Peat Sake), Colin Campbell (Whisky Blog), Jay Williams' Aphoristic Subplot, all you nuts at EUWOLS, Naresh at Sound of the Cinema, and any more I am forgetting(sorry), who have all linked to Dr. Whisky. Thanks to loyal returning readers everywhere and to EVERYONE who has forwarded links to friends and colleagues via word of mouth, email, Facebook, web fora, etc. Alex and Jane at The Spencerfireld Spirit Co.
Anne Knudsen for finding interesting bottles in her travels in the Far East, Espen Knudsen for challenging me to start this mission and Kristin Knudsen for putting up with it. And if I have forgotten you or if you feel you deserve a thank you, then THANK YOU. I raise two bottles to all of you... and proceed to pour them over my head. Thoroughly deserved - but beware you have set your standards very high now! Agree with Kevin photos are quite scary....also beware whisky in your eye really hurts! Couldn't you have cropped just a *little* bit more of out that photo? I have learned a lot from you blog . Keep the good work! Way to go doc, congratulations. I'm happy to see that my nominating you for the drammie has somehow helped to befoul the internet even further. Enhorabuena, nos alegramos por ti y por la salud de tu magnifico blog. Un fuerte abrazo desde Granada Spain. dude, congrats on the award and all the other exciting stuff but MY EYES BURN! 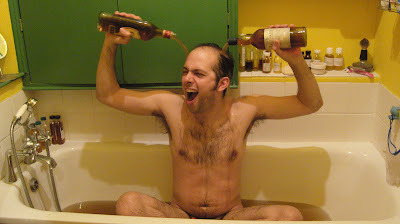 I will be sending a suggestion to Kevin that for next year`s drammies, all nominees will be required to sign a commitment to participate in similar public whisky bathing. Congrats! I hope it wasn't whisky you pured out. I think the stuff was made for drinking, not for bathing. How did you smell after that bath? congrats - are you going to bottle the bathtub whiskey as a limited edition 2008 expression of sam? i think you should.